Having the right selection of Professional Carpet Cleaning Chemicals to choose from on each job is the best way to guarantee that you always meet your customers expectations. There are many different options on the market for carpet cleaning chemicals and most people will have their favourites that they know they can rely on. We have selected out Top Ten best selling professional carpet cleaning chemicals. Ultimate Master – Self neutralising extraction powder that can be used as a prespray, cleaner and as a rinse agent. Traffic Lane Cleaner – A low pH and low foaming prespray suitable for most types of carpets. Chewing Gum Remover – This will not only dissolve chewing Gum but also lipstick, tar, plastic candle wax etc. Micro X Spotter – another spotter that can be personalised for you to give (or sell) to your customers. PROmite Water Based Protector – Combining Carpet protector with a Dustmite eliminator, great for customers with DustMite allergies! Citrus Fabric Pre-Wash – the perfect cleaner for low pile fabrics such as cotton prints. Designed to safely cut through body grease and grime. 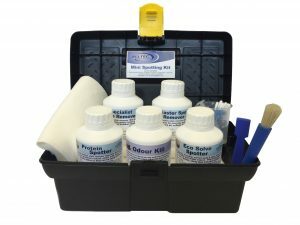 Liquid Ultimate Master – Primarily designed for use in Truck Mounts, is a high performance deteregent for safe and effective cleaning of synthetic and wool carpets, rugs, fabric, upholstery and other we cleanable textiles. Try our professional carpet cleaning chemicals before you buy! Complete the form below and we will send you a selection of sample cleaning chemicals for you try out in your own time. Ultimate master and Citrus Pre-Spray are staples in my carpet cleaning kit. Varying the dilution of the pre spray I have found it an effective pre spray for almost all situations.